Tuning specialists Severn Valley Motorsport’s Nissan GT-R-based Qashqai becomes the world’s fastest SUV. SVM (Severn Valley Motorsport) claimed the world record for ‘SUV top speed’ with its Nissan Qashaqi-R which achieved 382.4kph, eclipsing the previous record of 370kph set by a modified Toyota Land Cruiser. It will come as no surprise that beneath the bodywork little remains of the standard Qashqai from which the R model has been created. 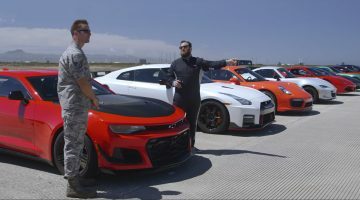 The transformation into its record-breaking specification started six years ago, when the British-based tuner fused the crossover with its sports car stablemate, the Nissan GT-R. Using a custom jig, the Qashqai’s body was lowered onto the GT-R’s chassis and running gear. Then SVM went about upgrading the powertrain: its first package lifted the twin-turbo 3.8-litre V6’s output from 523bhp to 838bhp; before it was raised further incrementally to 1134bhp; 1233bhp; 1479bhp and finally 1973bhp. All the extra performance comes courtesy of an extensive list of upgrades, which includes new drag-specification turbos, bigger injectors, KW suspension and an uprated intake system featuring a K&N air filter and carbonfibre manifold. Mike Little, SVM General Manager, piloted the SUV to within a few kph of a McLaren F1’s claimed top speed at a VMAX 200 event held at RAF Kendrew. 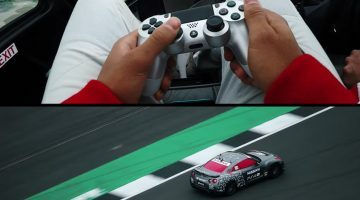 The Qashqai-R’s record speed saw it top an impressive list of supercars and hypercars in the video, edging out a Koenigsegg Agera RS by 13kph. Until SVM’s triumph, a Toyota Land Cruiser held the record. It delivered similar power to the Nissan and set its ‘fastest SUV’ mark back in 2017.